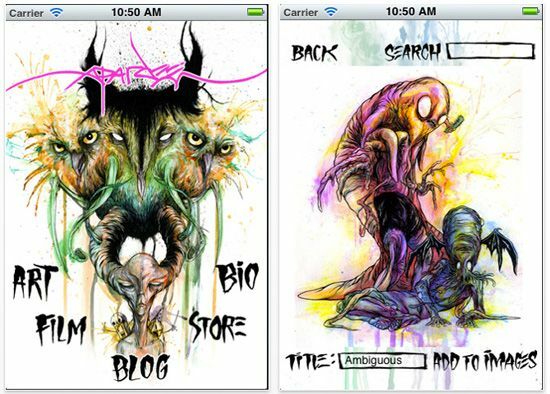 ALEX PARDEE'S LAND OF CONFUSION: MY FIRST ART-BASED IPHONE APP NOW AVAILABLE! Wanna stare at bright colors and argue with your friends about what kind of drugs I'm on half the time when I paint? (hint: nothing). Tired of attempting to describe to your friends that you saw something online that looked like a giant pink retarded bubble monster getting strangled by a gremlin with anger issues but have no reference to show them? Wanna check out everything that's going on with my website and art but you're bored of the regular old browser on your phone or touch that was SO 2009? Want to be the coolest inmate on death row? (*this one applies only to people on death row, sorry). Well, now, THERE'S AN APP FOR THAT! Yes, that is correct. I have begun my online mobile invasion. A few years ago I wanted to figure out a way to spread something fun to as many people as possible. After working with scientists on a way to evolve the herpes virus into a bullet that i could shoot into everyone at a party, along came iphone programmer and genius code writer JARRYD HALL, who convinced me that HERPES is also "So last year" and that if I really wanted to have fun, that I should start applying my art to mobile applications. Needless to say I tried to shoot him with my herpes gun for suggesting such a thing, but that's because I was confused. However, after a little convincing and hard work, Jarryd showed me what he could do, and a brilliant artistic relationship was born. Over the upcoming months, and hopefully long into the future, Jarryd Hall and I are going to be collaborating on some really fun art apps, games etc, all specifically designed with trans-media and the latest technology in mind. 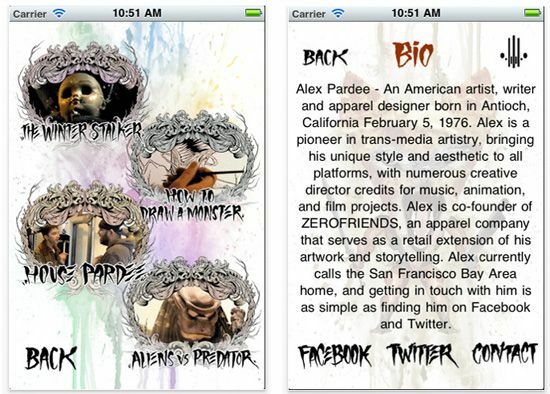 That being said, I am extremely proud to announce that MY VERY FIRST OFFICIAL IPHONE APP IS NOW AVAILABLE TO DOWNLOAD!!! This first app is simply a gateway drug into what is to come in the future. This first app is a combination of many of my different worlds (art, film, blog, etc) all available in an iphone-friendly mobile browser. As an artist who also digs and searches and stares at other artists' creations on the internet, i often find it hard to navigate through art and find good versions that I can share with my friends or show them what I am talking about when I reference it. For this reason alone, Jarryd & I basically created a downloadable library of over 200 mobile-friendly versions of my art that you can view and share ANY TIME, whether you are ONLINE or OFFLINE! In addition to basically downloading 200 easily searchable and viewable images, the app also has live feeds of my blog, links to twitter, videos, an in-browser store (Zerofriends), a bio, and more to come hopefully a ways in the future. Additionally, this app was designed ENTIRELY by myself and Jarryd. Just the 2 of us:) Jarryd sacrificed a lot of time with all of the coding and support and this was a really good creative experience for the both of us. So please take a moment to check out the app and if you feel generous, purchase it for a nice little $0.99 cents! And just so you know our reasoning behind making the app a purchasable app instead of a free app, there are 2 main reasons. 1.) Because you are basically paying for 200 instant free wallpaper images for your phone that you can change as much as you want to, share with your friends even if you are OFFLINE, and which will update in the future with more images. and 2) because we are creating these apps for YOU as well as for ourselves and for our art. We are hoping to continue to expand our learning experience with creating the app into way more involved apps, like photo editing apps, downloadable comic book, games revolving around my art, and other interactive games. But we can not continue to explore this new way of experimenting with my art without your support. So thank you in advance, even for considering. Hope you enjoy it and I will keep you updated on our new app adventures!! CLICK HERE OR ON ANY OF THE SCREENSHOTS BELOW TO VIEW/PURCHASE THE APP ON ITUNES OR THE APP STORE! Thanks again for your support! Keep an eye out for some fun interactive apps in the future from Jarryd Hall and I!